A "power chord" contains only a root note (D) and its perfect 5th (A). 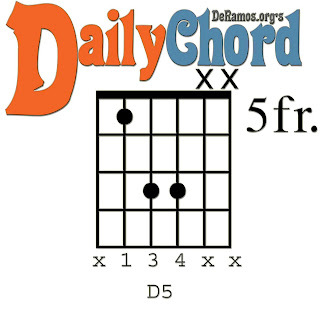 That's why the chord is often called "D5." 1. Place your index finger on the A string, behind the 5th fret. That's the D note. 2. Your middle finger will not be used in this chord. You may stick it out, as if you were flipping someone off. 3. Place your ring finger on the D string, behind the 7th fret. That's the A note. 4. Place your pinky finger on the G string, behind the 7th fret. That's another D note, one octave higher. 5. Playing only the A, D, and G strings, rock that power chord!